Urakami is a suburb of Nagasaki, being one of a number of villages that have over the years been absorbed into the larger metropolis. On 9 August 1945 at 11.02am, Urakami was laid waste by the second atomic bomb, ironically killing more Christians than had ever been killed in Japan during centuries of persecution. The church of Urakami, as it then was, was the largest ecclesiastical building in the Far East, of brick construction modelled on the Romanesque style. It stood only three hundred metres from the epicentre of the falling atomic bomb which destroyed thousands of homes and killed an estimated 73,884 people immediately and many others over the years to come with the lingering effects of radiation sickness. So total was the destruction that the police headquarters in Nagasaki was not aware of any damage until a few survivors made their way over the hill to the centre of Nagasaki; there was not a single telephone line left to report the damage. To visit Urakami now one could be forgiven for not realising how devastating the effect of the bomb actually was. It thrives once again and looks much like any other provincial Japanese city. Except, that is, for the peace park and excellent museum dedicated to the furtherance of peace and the education of the effects of atomic warfare. The degree to which this is achieved without the merest hint of recrimination is exemplary. The people of Nagasaki are in many respects very different from those in most other places in Japan. The new organ at Urakami Cathedral is dedicated to the 26 martyrs of Nagasaki. During the winter of 1596, 24 Christians were marched bare-foot from Kyoto to Nagasaki, being joined by two others on the journey, and crucified on a hill near Nagasaki on 5 February 1596. Thus begun a long period of persecution of Christians that lasted until the middle of the nineteenth century. This gave rise to the group known as the Hidden Christians who maintained their faith in secret, passing down the prayers and scriptures solely by word of mouth for some 250 years without church or priest. The new church at Urakami, now a cathedral, has a façade that bears some resemblance to the old but behind the façade is a modern space said to seat 2,000 people. The interior lacks any semblance of the old building and has been lined with sound absorbing material which reduces the resonance of this vast space to less than 0.5 of a second. There are now moves to restore the interior and improve the acoustic. At the west end of the building, a gallery stretches across its entire width. The gallery is rather higher than it needs to be which restricts the height available for the organ to a mere 6.5 metres. Hardly space enough for a 52-stop organ of three manuals. This necessitated a horizontal layout with the enclosed Récit behind the Grand Orgue and the Pédale either side. This presented a technical and artistic challenge, and organs are really meant to be taller than they are wide. Not only does this work better mechanically but organs that are wider than they are tall rarely look right. In spite of such unpromising criteria, Didier Grassin managed to produce a case design that has attracted an astonishing amount of critical acclaim from many quarters. Nagasaki has a number of organs, perhaps surprisingly. It was therefore suggested that the new organ for Urakami Cathedral should add a dimension to the organs in the area, all of which were more classical and North German in style. The idea to build an organ based on the mid nineteenth century French organ was therefore welcomed. It has three manuals and 52 stops. Filling a space as large as Urakami Cathedral with no resonance demanded a forthright instrument if the congregation was to be given a proper lead. The church is well attended, and at Christmas and Easter it is filled to capacity. But it also has to lead and accompany a choir and solo voices, so a large dynamic range was also desirable. Height did not permit a vertical layout, so the Récit was placed behind the Grand Orgue on a slightly higher pressure. The reeds were planted on their own chest on a higher pressure still. This proved to be a wise move and the Récit does not suffer for being placed behind the quite large Grand Orgue. The Pédal, as the case suggests, is on either side, the higher pressure Bombardes being on their own chest at the rear. The slightly more romantic leaning of the whole instrument caused one organist to say "At last a real organ!" The flue work is generously scaled to ensure that the power output required did not produce a forced tone. For the same reason, the mixtures were provided with a generous amount of ranks and in general of lowish pitch. A Mounted Cornet in the Récit is an unusual feature. It lends a useful dimension in working well as an Echo Cornet and also helps to boost and bind the Récit reeds to the flue work. Being smaller scale than the Grand Orgue Cornet, it will also combine with the Plein Jeu in the chorus to work as a Sesquialtera would in the treble. Both a Sesquialtera and independent mutations were provided in the Positif, so there is a generous sprinkling of mutational sound of varying tone quality. Of particular interest is perhaps the Pédale Mixture V. This has a tierce 3 1/5th as its lowest rank. We first used a mixture of this composition at St Ignatius Loyola in New York. The tierce rank not only adds point and definition to the pedal line but it also strengthens the 16ft pitch so much so that the 16ft pitch is clearly discernible even when no 16ft stop is drawn. Like the tierce mixtures so prevalent in English swell organs, it is also particularly effective in binding the flues to the reeds. On its own it does sound curious, but in the chorus it is most effective. With no less than 13 reed stops, there is also a generous variety of reed tone. All of the shallots are domed, and none of the resonators is capped. Even the Voix humaine was un-capped to ensure it was effective in the building. Loading was used very sparingly. Even the Pedal Bombarde 32ft is unloaded which proved an interesting experience, not least since it reacted completely differently in the organ to the way it had on the chest on which it was voiced. Essentially, it had to be re-voiced on site. The shallots of the 32ft octave are our usual wooden ones but in the treble of the 32ft octave we had to widen the opening considerably to produce the desired volume. It is of course full length. As with all other large instruments we have produced in recent years, the couplers are fully mechanical. The Grand Orgue soundboard is fitted with adjustable balancers for the first 24 notes and the Récit has balancers for the first 18 notes. 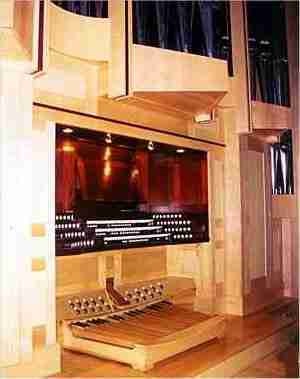 A few of the largest bass notes on the Grand Orgue and Récit are operated pneumatically from their soundboards. The Positif has neither balancers nor off-note chests, and the higher pressure Récit reeds are also mechanical and not assisted. In spite of this, the playing weights are very acceptable. The key action is balanced and fully floating. This is very necessary in a building only a few degrees from the tropics, with neither air conditioning nor heating. Frost is not unknown in winter, and in summer the temperatures soar to the upper 30s Centigrade. Humidity varies typically between 30 per cent and saturation. At a late stage in the conception of the organ, we decided to give the console curved and terraced jambs, as a surprise for the consultant who was not aware of this until the console arrived. No attempt was made to give the console a French nineteenth century appearance. 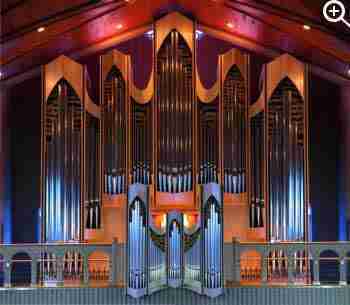 Rather, the curved jambs were conceived as part of the contemporary design of the organ as a whole. Terraced drawstop jambs become a little unwieldy on large organs if they are square to the case, and angled ones do not somehow look right if they are straight. By curving them and providing them with mouldings, a pleasing and comfortable console was achieved which was commented on very favourably by a few notable organists we asked to try it before it was shipped to Japan. An interesting innovation on the Urakami Cathedral organ is a system whereby the departmental pistons can be made to act as generals. By drawing a stop labelled "Combinaisons Generales" all the departmental pistons (including those for the Pedal) become general pistons, giving the organist easy access to the generals. This allows the organist to choose whether he wants to use departmental pistons or benefit from the easy access to the generals anywhere on the console; 64 levels of memory are provided as well as a sequencer. The installation of the organ was most enjoyable. Unlike our last installation in Japan, we were not treated to an earthquake. The nuns of the convent associated with the Cathedral kept us plied with food, cold drinks and cold wet towels (the installation started at the hottest time of the year). Each acquired a name we could understand, Driving Sister, Blue Sister, White Sister, English Sister (the only one who spoke English) as well as others. Members of the congregation took us on day trips, and we explored the rich history of Nagasaki and its excellent restaurants. The local television station took an interest, and the writer was pressed into his television organ-playing debut (why can you never find an organist when you want one?). 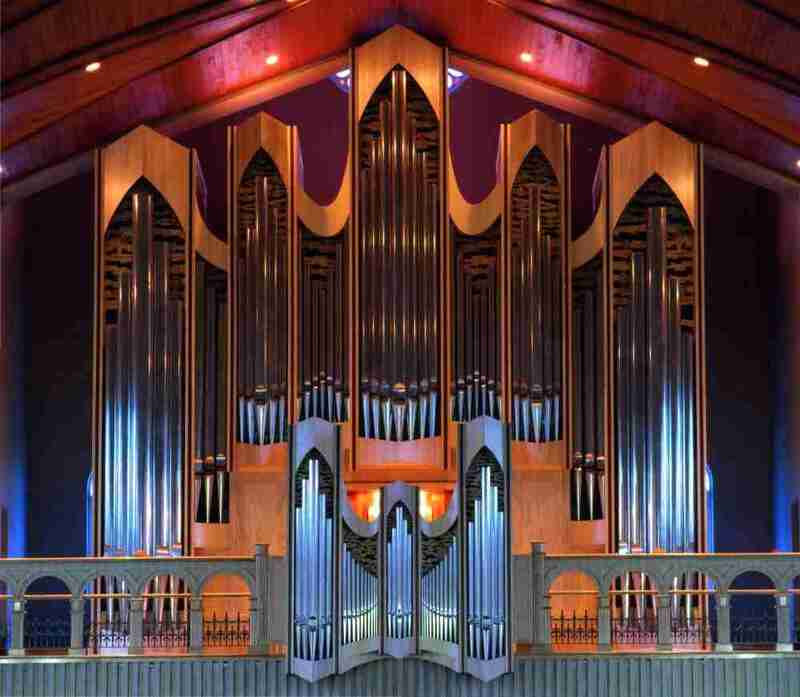 View the Specification of the Urakami Cathedral organ (completed 1996) and pipe scales.